Triathlon is seen as the ultimate in endurance events, combining three different disciplines, in one continuous race. There are different variations of the sport but the most common, and the style which will be featuring at the 2016 Olympic Games, includes swimming, cycling and running. Each discipline is completed in the order they are listed above and the athletes are timed over the full length of the race, with the winner being the competitor with the best overall time. There are also timed transitions, which happen when the athletes are preparing for the next discipline, such as the switch between swimming and cycling and cycling and running. Despite being in existence since the 1920’s, triathlon has a relatively short history as an Olympic sport. Indeed, triathlon will appear for only the fifth time at the 2016 Rio Olympic Games and is one of the youngest events scheduled. The Olympic triathlon consists of a 1.5 kilometre swim, 43 kilometre cycle and a 10 kilometre run. Due to the nature of the event and the fact each course can be different, there are no records held for the triathlon, in general or at the Olympic Games. The men’s triathlon at the 2016 Olympic Games will be held at Fort Copacabana on the 18th August. A total of 55 athletes will compete in the race and it is due to start at 11:00am local time. To date, there have been four different winners of the gold medal for men’s triathlon, with Simon Whitfield of Canada winning in 2000, Hamish Carter of New Zealand winning in 2004, Jan Fordeno winning in 2008 and Alistair Brownlee of Great Britain winning in 2012. Canada, New Zealand and Great Britain have also claimed one other medal each, making them the most successful countries for triathlon at the Olympic Games. Qualifying for the 2016 Olympic Games is already well underway and has been since 2014. Qualification is based on National Olympic Committees, as opposed to individuals. The top 8 NOC’s are allowed to enter three athletes, while the remaining nations can enter a maximum of two athletes. Every country and therefore athlete. must go through a qualifying process, in order to ‘win’ their place in Rio and this should have included the defending champion, Alistair Brownlee. In essence, there is no free pass for being a defending champion at the Olympic Games, however, an exception has been made for 2016 and we will come to that shortly. Qualification can be gained via Continental Qualifying Events, the World Qualification Event and the Olympic Qualification List, which started on the 15th May 2014 and concludes on the 15th May 2016. The top 8 NOC’s, will be decided by the first eight countries to have three athletes qualify through the various competitions mentioned above. However, it’s important to remember, each of the competitions above are prioritised, meaning the ITU Continental Olympic Qualification Events, the 2015 ITU World Olympic Qualification Event and then the ITU Olympic Qualification List are taken in to consideration for qualifying, in that order. There are a total of 5 qualification places up for grabs through Continental Olympic Qualification Events, 3 qualification places through the World Olympic Qualification Event, 39 qualification places via the Olympic Qualification List and 5 qualification places via the ITU Points List. 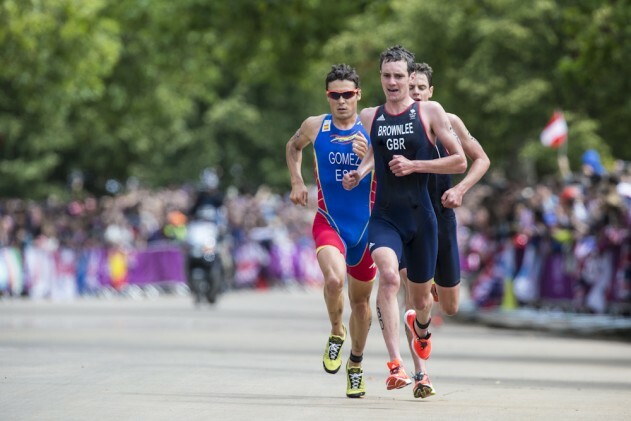 The host nation, Brazil, are guaranteed one place for the men’s triathlon. At the time of writing, a total of six countires are guaranteed their place at the 2016 Olympic Games, thanks to their performance in recent triathlon events. Having won the 2015 European Games, Great Britain, is one of the six to have already booked their place on the plane to Rio. Thanks to their performances at the ITU World Qualification Event, Spain, France and South Africa, have also qualified. Crisanto Grajales has ensured Mexico have qualified via the 2015 PAN American Games and Marcel Walkington of Australia, has booked his country a place via the 2016 Oceania Championships. Regardless of what happens in triathlon events between now and the start of the Olympic Games, these nations will definitely be competing in the men’s triathlon. A glance at the current ITU Olympic Qualification List, shows Javier Gomez, Richard Murray, Vincent Luis and Crisanto Grajales all inside the top 11. Therefore, they are all likely to remain well inside the top 39 and this should allow countries further down the list, a better opportunity of qualifying for the Olympic Games. Not only that but countries such as Spain, who have four athletes currently inside the top 39, will create an extra space further down the list, as they can only qualify a maximum of three times. With that in mind, there is plenty for athletes inside the top 50 to aim for, with chances of qualifying still open to them and their country. Interestingly, defending champions Alistair Brownlee and his brother, Jonny Brownlee, have both been automatically selected to represent Britain in the 2016 Olympic Games. Both athletes struggled in 2015, thanks to injury but the British Triathlon Olympic nomination committee pre-selected the pair, based on evidence of their ability to win a medal at previous Olympics. This has resulted in both Alistair and Jonny being able to focus their training towards Rio, knowing their inclusion is guaranteed. During the triathlon event at the 2012 London games, there was talk of the Brownlee brothers working together as team, in order to give each other the best chance of winning the gold medal. The majority of this talk was reported to be among their main rivals, as the brothers led at the front of the pack for both the cycling and swimming sections of the race. Will they do the same in Rio? We will have to wait and see but the race itself will be a lot different. The cycling is set to be tougher and the swim will be in the sea, not a lake as it was four years ago and this will make things more difficult. In terms of the Olympic event itself, triathlon is a rare event, in that there are no heats during the games, just a one off race. It remains to be seen, just what impact the injury problems the brothers have endured since London 2012, will have on their Olympic bid in Rio. Spain’s Javier Gomez, who won silver in London, will be looking on with interest, as he knows the only way he is likely to claim gold, is if the Brownlee’s are struggling with fitness. That’s how dominant the brothers from Yorkshire are in the sport. Mario Mola, also of Spain, will be another athelete looking to topple the English pair and the Spaniard is currently top of the ITU Olympic Qualification List. The next major event in the lead up to the 2016 Olympic Games, is the Jewel World Triathlon in Queensland, Australia. Jonny Brownlee will be there to defend the title he won last year, as will his brother and a whole host of other Rio Olympic contenders. It’s unlikely the release of their own brand of yoghurt will help in their push towards Olympic gold later this year. However, the Brownlee brothers will be looking to put down a marker, ahead of what is promising to be one of the highlights of the 2016 Olympic Games in Rio.